This my entry for Dusan Writer’s User Interface Contest. Feedback about the design is welcome — leave a comment! Pick low-hanging fruit. Make simple changes that offer large improvements in usability. Keep your feet on the ground. Suggested changes should be feasible, not pie-in-the-sky wishful thinking. Make it better for everyone. Improve usability for all users, and you’ll improve usability for newbies as well. Don’t cripple the UI. Generally, avoid “dumbing down” the UI as a strategy for making it more approachable. Note: It is not my intent to make any suggestions regarding interface style / theme, only usability and functionality. I propose a substantial, but not infeasible, reworking of the main toolbar at the bottom of the screen. I’ll let this annotated concept art do the speaking, as I’m running short on time. 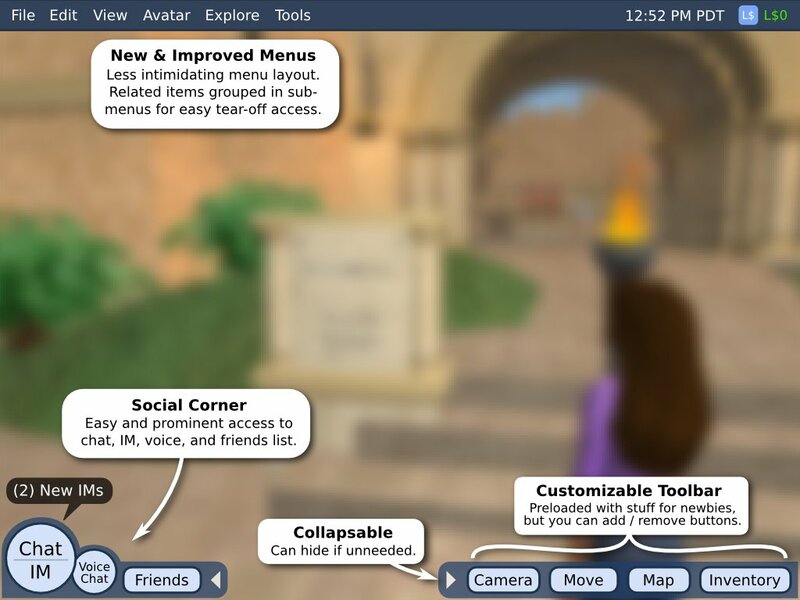 Second Life is a complex application, and its menus reflect that. Many users find the huge number of menu items intimidating; further, the lack of any sort of logical arrangement to these menu items makes the menus difficult to learn and navigate. I therefore propose a substantial reorganization of the menus to correct these shortcomings, by grouping related items into menus and submenus. A full example listing is given in Appendix A. Menu items are organized in a more logical manner, making them easier to locate. 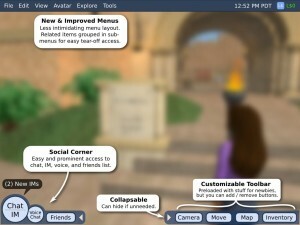 Top-level menus are smaller, so that the user is not overwhelmed by them. Useful related functions (e.g. building tool menu items) are located in sub-menus, which can be torn off for easy access. “Logout”, to log out your avatar and return to the login screen without needing to restart. “Reconnect”, to log out and then log in again without needing to restart. “Refresh Avatar”, which rebakes your textures and avatar shape. One of the timeless struggles in Second Life is that of locating something in your inventory. The tendency to accumulate a large number of items, combined with crude and difficult organization and filtering tools, can make inventory management overwhelming for newbies and oldbies alike. The task of finding an item has been made easier by the addition of the search feature, “Recent Items” tab, and the ability to filter the view by inventory type, but there are still a number of improvements that could be made. Favorites. This tab displays only items and folders which are marked as “favorites”. 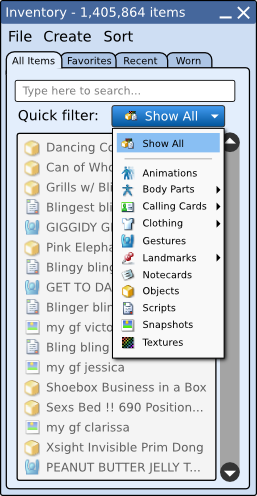 An item is marked via the right click menu, as described below. 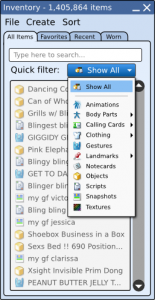 The favorites list could be stored locally as a data file, or on the server (with Linden Lab cooperation). Worn. This tab displays only clothing and objects which are currently worn / attached to the avatar. Either category tab can be further narrowed down via the Search box or the Quick Filter selection box, described below. The interface for accessing current filter functionality is awkward and hard to find. Many users don’t even know such functionality exists; many of those who do know about it find it awkward to use. Simple, prominent access to the filtering system would make it more usable, and allow users to quickly refine their inventory searches and views. My proposed solution is the “Quick Filter” selection box, as illustrated above. The user simply selects an item type from the menu, and the inventory will display only items of that type. For item types which have more specific sub-types (Body Parts, Clothing) or multiple states (Calling Cards, Landmarks), the corresponding menu entry has its own sub-menu, listing the more specific types / states. 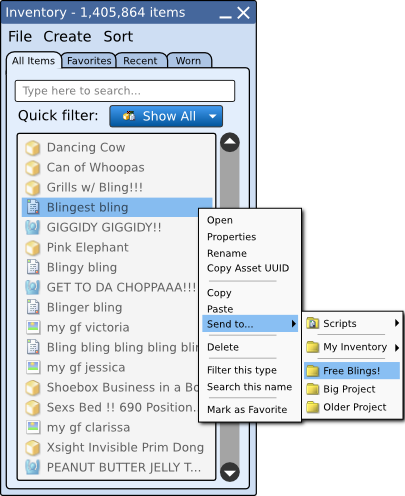 The Quick Filter selection box can be used alone or in combination with the Search box and/or the various category tabs. Send to… Allows the user to move the object to another folder: the folder for that item type (or a subfolder), any subfolder of your inventory, or any folder another item was recently sent to. Filter this type. Sets the Quick Filter type to the selected item’s type. Search this name. 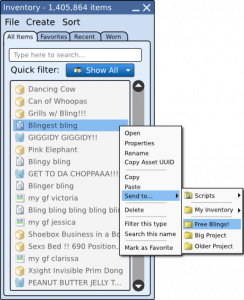 Populates the Search box with the selected item’s name, allowing the user to easily search for items with the same or similar name.